Jack was the guy who could change the whole game. He was quite possibly my soul mate. But time and circumstance were against us—there was no easy way around it. I was moving back to New York in two weeks and his sister, Aubrey, was the one person my family hated most in this world. How would his sister--the enemy—deal with another Edwards girl claiming what she believed was hers? The idea of letting Jack go crippled me. Would I have to cut ties with the only man I’d ever let into my heart? Faith Andrews is living out her dream right outside the greatest city in the world, New York City. Happily married to her high school sweetheart, she is the mother of two beautiful and wild daughters, and a furry Yorkie son named Rocco Giovanni. When she's not tapping her toes to a Mumford & Sons tune or busy being a dance mom, her nose is stuck in a book or she's sitting behind the laptop, creating her next swoon worthy book boyfriend. 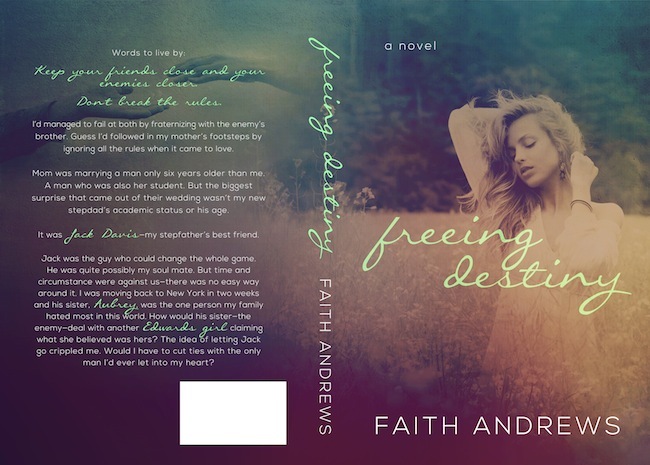 Coffee addict, lover of wine and cheese, and sucker for concerts and Netflix, Faith believes in love at first sight and happily ever after.